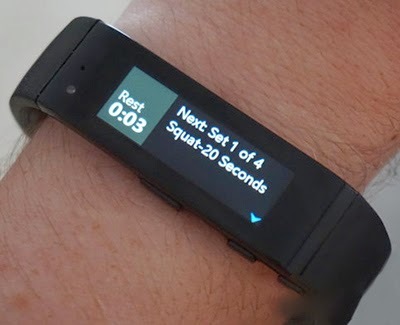 Microsoft has launched the Microsoft Band, a fitness-focused wrist-worn device that connects to Microsoft Phones, Android, iOS and OS X. It will also integrate with Apple's HealthKit service and Health app for iPhone. The Microsoft Band is very similar to Samsung's Gear Fit, offering a thin watch-like device that wraps around a user's wrist. Up top is a rectangular colour touchscreen that displays content horizontally, which can be somewhat awkward when holding a watch in front of your face with your elbow at a right angle. A resizable clasp is at the bottom of the Microsoft Band, allowing users to find a size that's most comfortable for them. The device is also sold in sizes of small, medium and large. Inside the band loop is a magnetic charging attachment and a heart rate sensor. Microsoft advertises that the Band will offer two days of runtime on a single charge. The colour display turns on for notifications but is turned off the rest of the time, and requires a button press to be enabled. The Microsoft Band features integrated GPS for run tracking (the Apple Watch does not feature integrated GPS).